Dolphins and humans are very similar creatures. A new database of bottlenose dolphin DNA and associated proteins could possibly aid in dolphin care and research on human medical problems such as stroke and kidney failure. 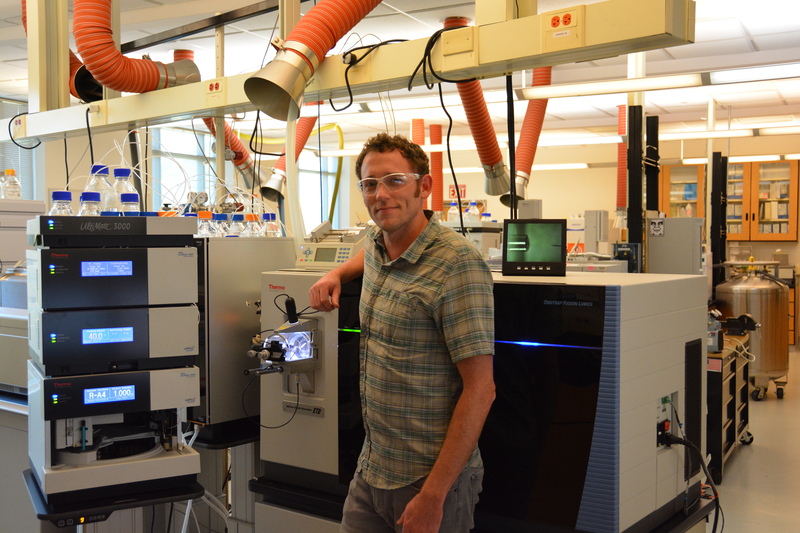 Researcher Ben Neely, standing in front of the ultra-high-resolution tribrid mass spectrometer which was used to catalog and measure bottlenose dolphin proteins. “There’s this gap in the knowledge about genes and the proteins they make. We are missing a huge piece of the puzzle in how these animals do what they do,” said Mike Janech from the Medical University of South Carolina. His group has been researching vanin-1 and has identified numerous other potential biomedical applications for the dolphin genome just created by NIST. To gather the needed protein information, Neely and his team used a specimen provided by the National Marine Mammal Tissue Bank (NMMTB), the longest running project of NIST’s Marine Environmental Specimen Bank. The bank is an important resource for documenting trends in pollutants in the environment, and the study of changes in marine animal health. Half of the approximately 4,000 marine mammal specimens are collected as a part of the Marine Mammal Health and Stranding Response Program and are gathered by trained personnel after animals have died along coastlines. The specimen provided for Neely’s study was known to originate very close to the Hollings Marine Lab. “It's amazing to think that we are at a point where cutting-edge research in marine mammals can directly advance human biomedical discoveries,” he said.